Searching for the safer better life. Can hail the enormous contributions that Tools, yes tools, and skilled people using them have made in our search for this safer better life. Yes there have been many successes but the biggest ones happen in spite of us. Tools Tools and more Tools maybe thousands of them but which ones and who should we chose to run them in our search for this safer better life? What are the biggest impediments that we have to overcome in this search for the better life? Could we be among them? Using Scientificscience* in the search for the safer better life without the need of understanding science. Can this be done? Yes it could and can be much easier than using the current process which has a success rate less than 1 out of 5 by the simplest test*. To start with,,,,,, he biggest challenge in the search process starts with our 'wordologists / semanticsist' who at times must feel jaded while trying to make the Search for a Safer Better Life more better. Their life is not an easy one but really good ones maybe really, really good ones will find their way and be able to decode the messages in this document and maybe just maybe 1 out of 6 billion will get ths safer better life from the recommended searching methods. Even as we read this note most of the time may be spent worrying about the authors spelling punctuation, grammar than the content. If one is working on this premised conundrum rather than the search itself and it must be done no matter how much the valuable discoveries are delayed during the search. Good luck best wishes. The first, the simplest, the most important, the biggest challenge, the one causing the biggest waste of time, yet the hardest to recognize, and the hardest to guard against , are the tools called definitions. Yes, Yes, 'Definitions'*. This is easy to say ---------- but almost impossible to believe or do. Some simple examples to help us to keep us focused on the problem with definitions and accuracy getting into the way of the search. 1, A little white lie", what ever this means? If it is truly white then it is truly composed of millions and millions of colors. So instead one should be calling it a little colors lie, which when blended together make it, or them colors white. To get at the truth it is necessary to sort the colors out testing their honest truth colors, the half truth colors plus any mistake and normal color their errors from the sum of colored lies struggling the get the right white of the lie so that it be small enough to be little enough to be a little white lie. This jumble of words, yes words, can pile up, and if we let it, this part of the project will block the path in the search for a safer better life, at least it will slow it down. We need a sorting tool, A word sorting and defining tool from the wordologist. Presumably they have been trying since the days of the city of Babel with only margin able success. By comparison The scientificscience scientist has tried a different aproach. Lets get back to the word white. There is a analog sorting tool in the spectrum of scientificscience that might shed some light on the white ,white, problem. White, white, by natures rules or laws (what ever). is a rainbow of colors in the color region humans can see but also spreads on both sides of this rain bow to colors we cannot see. on the red side we can feel but not see its warmth. On the blue side we cant see it but can get a sun burn from it. The rest of the "colors" we don't 'see ,sea, c,' without specials instrument. From this jumble of words no matter how one arranges them can one see just a glimmer of the different worlds we all live in one of just words the other with the tools words, plus, +, instruments to make physical measurement. Biggest frustration the world of scientificscience is that it is a very foreign world to most and we suffer from its foreignness. But there is hope! It comes from a few grains of sand, fashioned down to the form of a prism. In the hands of a specialist it can show a beautiful rainbow to sort out the truer truths from the mistakes, the lies, the conjectures and errors about white light but it needs the highest possible 'accuracy'. One does not need to know how this happens to make it happen. It does requires earned trust that it will happen in the search for a safer better life. The important tool to understand and use in the world of wordology is the word 'accurate' in all of the searches for this safer better life. The most important tool needed in the search for the better safer life is accurate communication especially among those affected by the discoveries in the search leading to this safer better life. It may be hard to believe but the word 'accurate' holds the golden key that opens successful search for that safer better life. 'Accurate' is the flagship word but it has a major man made hurdle to overcome even if we can get some small help in the search. The hurdle is that the word 'accurate' first and foremost is a word. Yes a word. Words have all kinds of human constructed problems associated with their uniqueness and their suitable accuracy in communications. Ask a random number of people this simple question, "Is the word accurate accurate enough to be accurate?" Stand back and listen. The answers will speak for themselves. This is a technically legitimate question. Note, one of the potential dangers in asking it is that one can find oneself trapped going around and around on this question and lose track of the original goal of searching for a safer better life simply because of semantics. Semantics, another word to be reckoned with, where does it stop? How does one even slow down the circular process? Going around and around with semantics and getting no where except to become dizzy, tired and frustrated without finding a safer better life. It sounds hopeless but it's not. It can be trapping only if you let it. The basic fact is language will always reigns no matter how ambivalent, cumbersome, and arbitrary it may be. No matter what, we still love it. We work with it. We love our fiction, our texting, our showing off. Our mighty constitution uses it. Some of it is even recorded by hand in stone or metal. It uses ink or any medium at our disposal - even planes for sky writing. It's transmitted around the world and into outer space at the speed of light. It is coded and decoded. It is just plain nifty but dangerous. why? The meaning of words can change depending on their usage, it is unregulated and can be and has often been used to distort reality! The stair case figure of course is a man made illusion in construction and interpretation. It an example of how one of our most important senses can be mislead. Our sense of 'sight'. But how many other sense are reporting to our brain miss leading information to our brain because of the problem of mis-interpretation of words describing what our sense are reporting. All of these issues are cluttering the path to the safer better life and need clearing out. Going around and around in a one sided path some times upside down some times right side up, wearing out a path so deep one cannot see not out of the trench . Debates and arguments can get trapped in this wordology syndrome. Some humans (people?) believe and forecast that the first and biggest impediment one faces in the search for a better life is the lack of suitable accuracy and rigor inherent in a common language. This forecast angers many in the language business and those who enjoy it as a hobby especially as a putdown tool. Maybe "enrages" is a more suitable word than "angers"? Not convinced that the above is not just idle chet chat.? Read on about the size and complexity of the gold standard of the English language. This is not an unsung problem with words in general but there is a tested solution, for the search for a better safer life which is used, but not enough to minimize the word problem. It requires little to no effort other than making your carefully informed opinions known. Effectively known. Words in the technical world have to work extra hard at producing even a semblance of true success than they do in everyday use. This document is almost a perfect example of trying to get a simple but important messages engaged to help the search for a .better safer life. But how hard will it be. to do so? A few examples are given below of the problem with words followed by a discussion tentative solutions to be tried to help the search for a safer better life. Words have definitions. That can be looked up in dictionaries. As an example we have looked up the definition of the word accurate to see if we are using it accurately. CORRECT, precise, exact, right, errorless, error-free, without error, faultless, perfect, valid, specific, detailed, minute, explicit, clear-cut, word for word, unambiguous, meticulous, authoritative, reliable, canonical; Brit. informal spot on, bang on; N. Amer. informal on the money. FACTUAL, fact-based, literal, correct, faithful, exact, close, true, truthful, veracious, true to life, telling it like it is, as it really happened, lifelike, authentic, realistic, fair; convincing, careful, word-perfect, strict, conscientious, punctilious, painstaking, thorough, scrupulous, rigorous; informal on the mark, on the beam, on the nail, on the button; Brit. informal spot on, bang on; rare verisimilar, veristic, veridical. WELL AIMED, precise, on target, unerring, deadly, lethal, sure, true, on the mark, careful, meticulous, painstaking, precision; Brit. informal spot on, bang on. So how accurate is the word accurate? How many word were used to define just one word ?Add to the English language all the other languages and you have a sizable amount data available show to the magnitude of the problem facing the search for a better safer life! 2nd Example showing more of the magnitude of the word / language problem. Most taught, most discussed, most dynamic, most manipulative, most flexible, most corruptible, most dangerous, is our blessed Language . Language (tool) that is written, spoken, sung, pictured, worshiped by all of us in the romantic sense. The common form of language ( tool) has been, at times, more than a little ambivalent, cumbersome, and arbitrary. Adjectives adverbs can drive the transportation of your valuable information crazy before it gets to its destination. As always there are exceptions. Poets, Comedians and those who write advertisements love it and might go out of business without it. 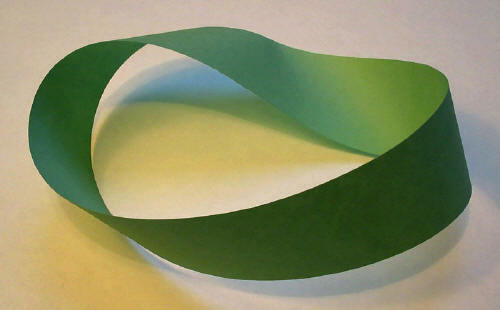 However to use the common language as the only tool in any search one could get trapped into circular augments, like the little guy below, that is wasting his time burning up energy without getting anything for it but entertainment, which could get tiresome emotionally, spiritually, intellectually, philosophically. This is a description of the Oxford English Dictionary copied from wikipedia....According to the publishers, it would take a single person 120 years to "key in" text to convert it to machine readable form which consists a total of 59 million words of the OED second edition, 60 years to proofread it, and 540 megabytes to store it electronically. As of 30 November 2005, the Oxford English Dictionary contained approximately 301,100 main entries. Supplementing the entry headwords, there are 157,000 bold-type combinations and derivatives; 169,000 italicized-bold phrases and combinations; 616,500 word-forms in total, including 137,000 pronunciations; 249,300 etymologies; 577,000 cross-references; and 2,412,400 usage quotations. The dictionary's latest, complete print edition (Second Edition, 1989) was printed in 20 volumes, comprising 291,500 entries in 21,730 pages. The longest entry in the OED2 was for the verb set, which required 60,000 words to describe some 430 senses. As entries began to be revised for the OED3 in sequence starting from M, the longest entry became make in 2000, then put in 2007. All of this is only for the English language. Multiply this by all the language all the dialects. One can easily see the magnitude of the issue. There is lots of room for the misuse of language. It is the classic double edge sword capable of hurting the attacker or the attacked, intentionally or unintentionally. It is dangerous because of its inherent lack of absolute accuracy. It can and has been impediment, an obstacle, to the search for the better life. Unfortunately language with all of its virtues and drawback is close to the only common tool we share. The most worrisome and least discussed reality is, almost half of us cannot , casually, grasp the full content of a written or spoken declaration like that poor fellow holding up the sign in the image below. There is a tool which has been successfully used in the search but is often under threat of being slowed down even stopped for unreasonable times in application by powerful organizations that feel threatened by its use. They use simple misleading language arguments of doubt. This troublesome tool, to some, is called basic scientific research. Its most magnificent deeds seem to happen by chance and in spite of us "us the language people." Scientist when communicating with each using traditional language in the early days of science were compelled by the language issue to streamline their communication methods or be ignored misunderstood something no productive scientist can stand for very long. There was one more very significant change made by the scientific community about the same time, one that may have permanently isolated scientist from the rest of the world for ever! Since the times of Galileo and his equally pushy colleague scientist's creditability had grown substantially using instrument many time more sensitive then native humans senses. Does this phrase symbolize an attitude or condition that some may have toward science, especially basic research. Does this attitude slow The search for a better life? Modern science started not so long ago by a small group of Italian fellows like the one called Galileo who was a poorly paid teacher with a small business on the side to make ends meet . Galileo's business was based on making instruments of war using the new way of looking at and describing the laws of nature. One instrument he designed was a combination aiming device for cannons and a calculator for all sorts of military things. His competitors, who had connection in high places and were still using old fashioned but common sense methods which were wrong in designing their instruments. 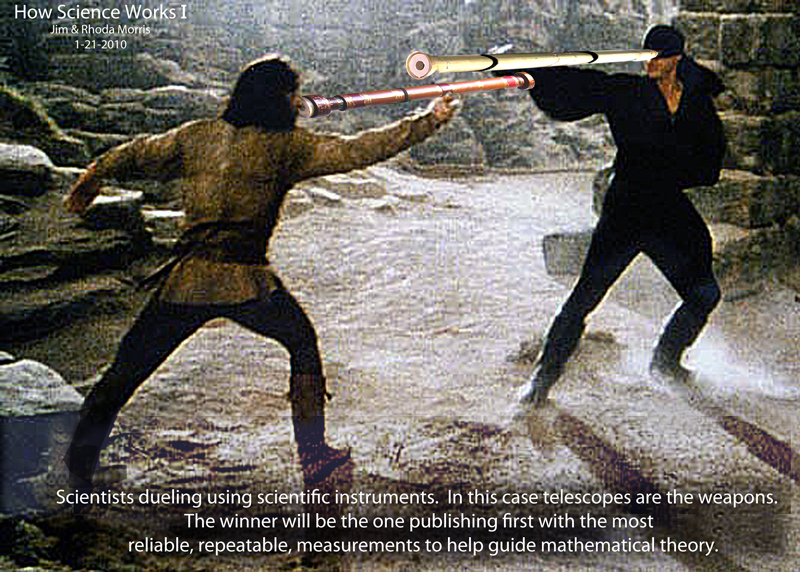 They were bad mouthing Galileo instruments to push him out of the market. This was a common approach that is still used today and it was hurting Galileo business by using simple common-sense type arguments in their sales approach. The simpler the better but the wrong-er they got. Through out Galileo's business life he found, experimentally, a number of instances where Nature did not follow our human common-sense arguments. Falling bodies like cannon balls was one of them. Galileo found more business opportunities using nature laws instead of using the more traditional common-sense approach. 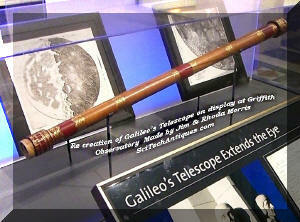 Another of his military products, a really famous one, nearly cost Galileo his life, . 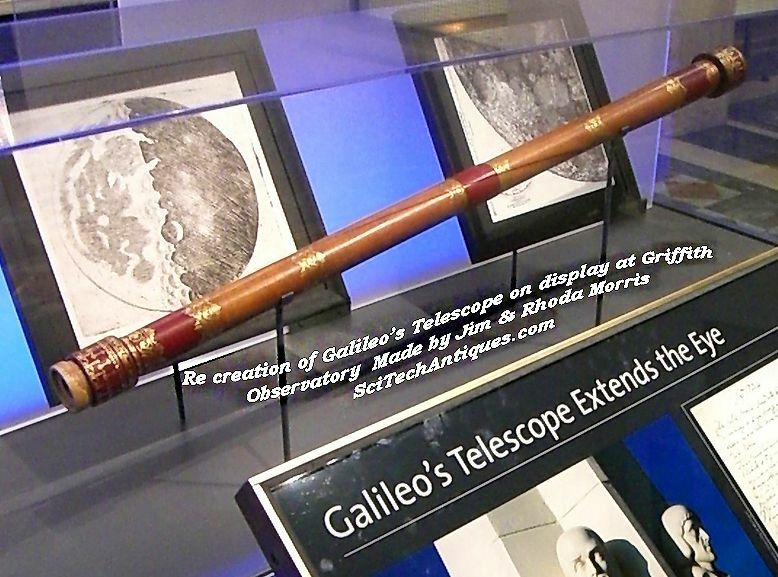 Someone named this instrument the "telescope". More and more scientist began finding many human common-sense laws were bendable, where as they found Natures laws fixed, testable, using measurements of Time, Length, and Mass . This left scientist no other choice but to abandon their human judges and the juries pronouncements and to adopt Natures judgments that could be discovered and tested instrumentally by scientist using precise and accurate measurements of Time, Length, and Mass. 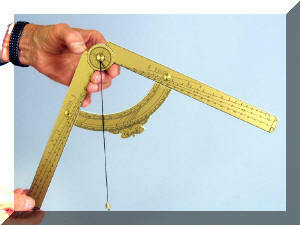 Instrument and measurements of the laws of nature. Above is our goddess of scientific measurements. We borrowed her from the law and justice department. Her hand grasps the sword for use in the enforce human's laws. 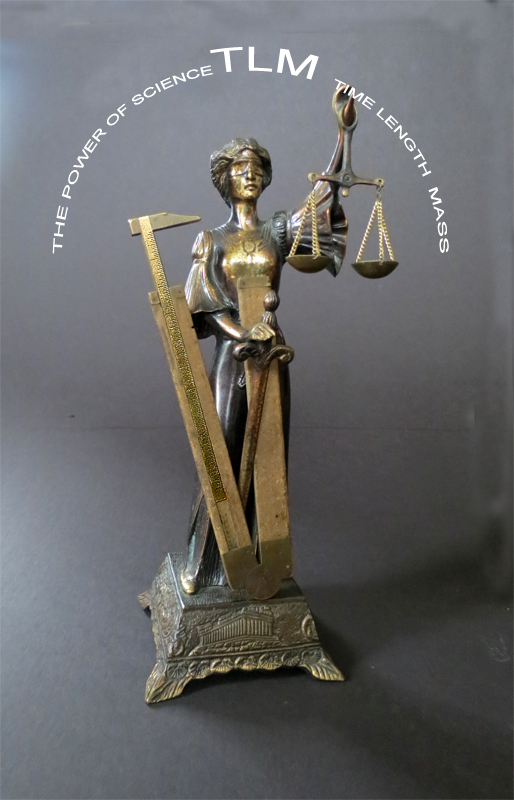 Her balance, a type of scale for comparing things like the plus and minus of the law. We added a ruler to her tools to extend instrument inventory to three. Three are needed by the physical science world. They include measurements of Time, Length and Mass. Can you find them? Hint, the balance pans are used in comparing mass's also they are used to measure and compare time by the swinging periods of the pendulum . either pan can be used. TODAY'S LABORATORIES ARE A BIT DIFFERENT THAN IN GALILEO'S TIME BUT THE RULES OF CONDUCT, HE HELPED PIONEER, ARE VERY MUCH THE ALIVE. THEY ARE GETTING STRONGER, THROUGH PRACTICE, OVER THE LAST 400 YEARS OF TESTING. 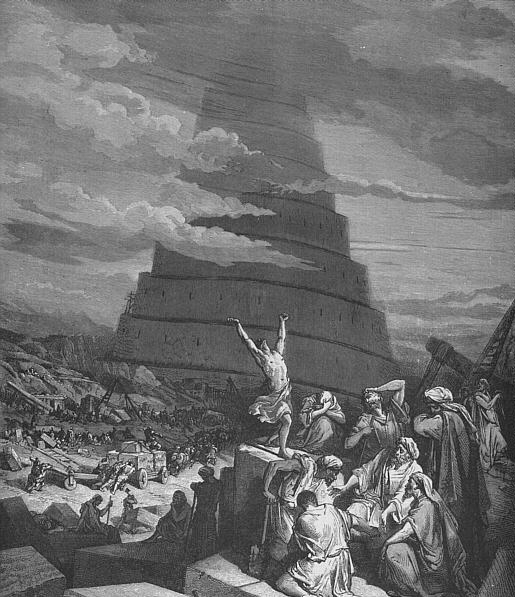 Tower OF Babel The Confusion of Tongues. All these wonderful transformations had a down side. Only scientist can get the full meaning and the precise nature of other scientist work. To the rest of the world it all sound like gibberish or coded language, consisting of modern day texting, Greek symbols. Some scientist called all this mathematics. One world was divide into two with a steep wall separating them. One world is where the scientist and their sponsors. work the other the bulk of the population and the sponsors of business and government function. Does this affect our search for a better life ? The enemy's of science have long since learned not to question science. so much as to question the ethics of those practicing it. Why not? Humans are only common-sense guidance creatures that have learn from experience and their natural sense of sight, sound, touch etc. Scientist have learned this first hand not to trust even each other and themselves with out solid physically measure-able proof. Has this change slowed our search for a better life? Aren't they?-- Maybe just a little bit? There is little enforcement of law against it? Common sense backed up by personal experience (data) kicks in. A common-sense decision is made. Science is wrong cause scientist are wrong? IS more than just being wrong!! It is a serious loss of personal pride? This is a very very serious issue for most? If there is no immediate reason for admitting being wrong chances are--- one might not admit being wrong. Round one science loses? Hmmmmmmmmmmmmmmmm? (Lots of business ,professions etc. are treating the word science as a super adjective to heighten the creditability of their business or profession. Example have flourished in recent years. Does this attitudes slow The search for a better life? It was the early 1600's when Galileo and his telescopes were in the middle of Nature laws versus religious laws discussions. The religious enforcement tool of choice, for proving their case, was burning the perpetrator at the stake, in public, setting examples to anyone, especially scientist, for not obeying the religious laws or protocol.--- . This attitude sets the tone for the following conversation which may best be expressed in a 1623 (400 year old) Shakespearian rhythm which was in vogue at a time when science was coming alive. Let the authors set a Shakespearian stage. The actor below is playing the part of Galileo presenting the new 1600's point of view of science and scientist. With his telescope in the raw, his remarks might have been opened with the famous dialog ! Citizens! Scientists! Teachers of science! Lend us your ears! Your eyes! Your emotions; and imagination. We come to bring the emotions of scientific discoveries. nearer to you, not to praise them. So let it be with Science. The search for a better life? Can we ever be serviced by science when it is weighed against all powerful agents often preferring not to take into account Nature Laws, Laws which are expressed and studied scientifically with measurements of Time, Length, and Mass, Laws of Nature not always in synchronization with human made laws derived from our eternal common-sense judgment? Most humans live under what seems to be a tyranny of rules, laws, regulation and guidelines, so many it appears hopeless to believe one has any choice in any thing we wish to do or chose to do. It even seems dangerous to speak out for reason to those who enforce these laws. In a nut shell we almost have to act as though we do not have any real say in what is going on here there or anywhere. What is our recourse but to dig in -- chose our common-sense emotional position and stand our ground so as not to lose face, lose pride. -- Pride one of humans strongest held emotion which is an all, powerful motivator is not taken lightly by any normal human. Pride of self is all. Is there no hope for change without violent revolution? Can science help answer these questions? Humans may have done it to ourselves in letting the creation of laws for governments and religions where we have left enforcement in the hands of strangers which may have questionable allegiance to the original intention of the law. It seems at times we don't own our lives, our bodies to do with as we are physical governed to do as long as the brain is legally (electrically) alive. When the brain is (electrically) dead the body parts remain alive ----- and are commodities? Since scientist do most the work on how nature works we want to know how good are scientist at this task. Do we need to be told or even suggested by complete non science strangers how much we can trust our scientist? This, the eternal question; will it or would it, ever be possible, or should we have the right, to the answer to these questions? How well are scientist doing the job for us-- or even what or when can we expect from them? Common-sense derived laws in the Common-sense World (CW) Are more likely to be accepted in any debate with the Scientific World (SW). Because. 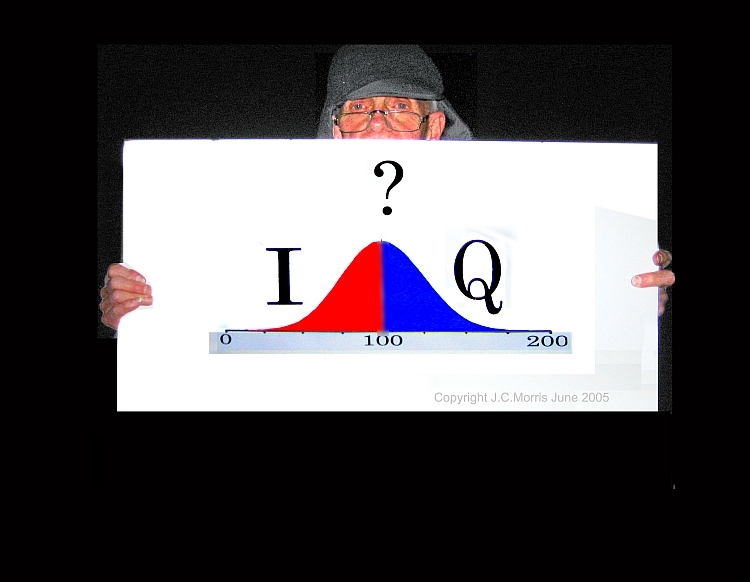 It uses more direct , easier to understand, common sense laws in their arguments versus sci-techs offer us more convoluted statically saturated data, short cut formulas, burdened with obscurity----arguments. It is very different with Nature. Nature has laws. Nature enforces its laws. Examples; the force laws of gravity, electricity, magnetism. These are not about to be changed in any human generated court. Scientist have assumed a role of exploring and reporting the laws of nature. They debate and battle to get them right. Nature and its laws will have it no other way! Below Marie Curie in the background seems to be contemplating the usage of the laws of nature. In our photo we have a hand balancing a brass ball the approximate size of a Uranium 235 chunk needed to make an atom bomb. Perhaps many have taken note that laws for governments, religions, and sciences are parallel only bearing tiny differences in , methods and strengths of enforcing them. They all include theory and experimental data. The experimental data has the final say until further work expanding its results gives a clearer understanding of the laws available. 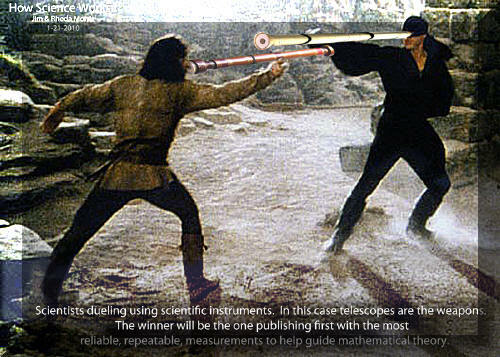 In scientific work studying and discovering new laws of nature measurements scientist are always pushing for greater precision and absoluteness accuracy. If they are wrong it can be a catastrophe on a massive scale. Science is not a game. There is serious trouble for everyone buried in the words --- measurements, measurements and measurements. Nature is absolute. Humans are relative creatures, "maybes" highlight wishes in their decisions. Thus the cause for much debate and confusion. 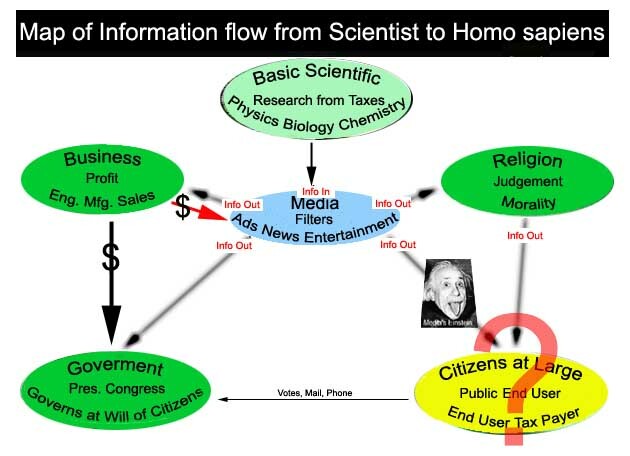 between the scientist, scientist and non-scientist. In the end Natures has its way. All living things must measure things just to get a place to exist.. Scientist have made a profession of using highly specialized instruments measuring the laws of nature relevant to humans beings. . The range of measurements. Scientist achievements have broached pure guesses at the size of the visible universe and things smaller than the parts of atoms they also cover thing between these extremes. This document is dedicated toward reducing confusion-- if possible. If not--- at least provide an environment to raise ourselves a little bit more above pure rancor in debating basic research efforts that have profound impact on our search for a better life This is sum of our challenge for ScientificScience. 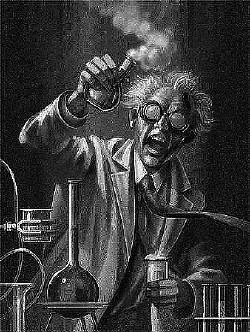 Click on the picture below See a real disappointed scientist in action--. Click the picture below to see what a chunk of U 235 is good for besides bowling--. Is the above Scientific Science? 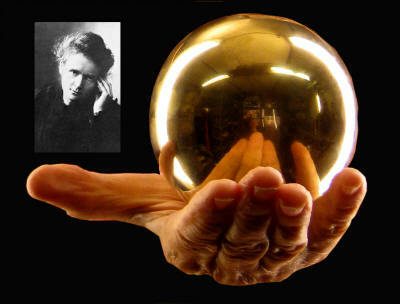 Madam Curie shown in one of her more reflective moments. Marie died of Leukemia, Einstein a broken heart. 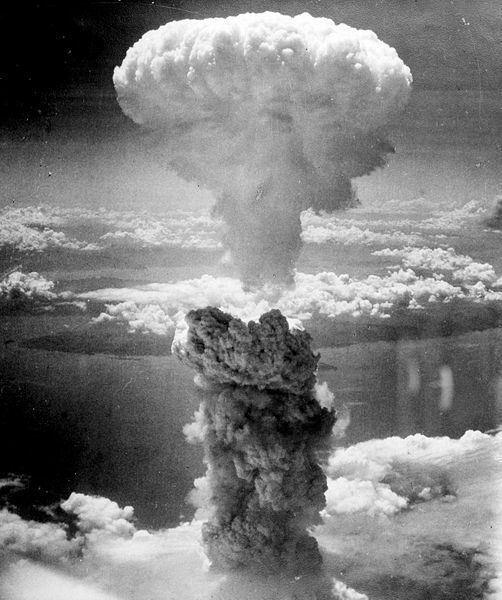 The nominal spherical size of the critical mass for a 235U nuclear weapon is about 17.32 cm (6.8") in diameter, 56 kg. This is not much considering the vast destruction it can wreck and the many thousands of people it can burn to death. On the other hand this bowling sized ball can provide thousands of people the comforts offered by electric power. Having come this far in the conversation lets poke into this a bit more with a single super simple example taken from an unimpeachable source. The reader perhaps remembers the story as told in a widely read and quoted religious source the Gospel. it is the story of the tower of Babel. We are told that languages were confused. It clearly identifies by who, why, and where. It is true that there are many languages, but, but, and but is it true in the story how they got that way? Maybe the who that was purported to have changed everyone's language was wrongly accused. Some could and do challenge the story, but not the message? The accuracy of this story would then be questionable? If it is? Then what about all the of the rest of the stories in the text. Follow the same route. Wouldn't they be questionable also? 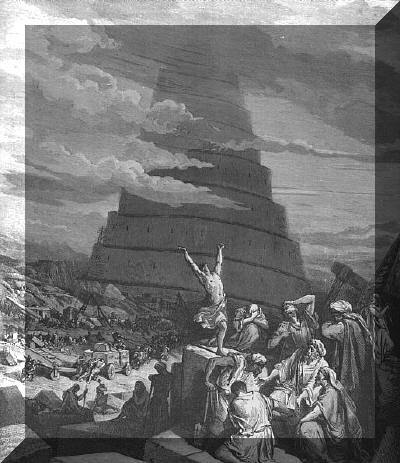 Many may have similar trouble with the illustration covering the Babel story? What about 'all illustrations' what about them? and maintained like the little fellow climbing the eternal stair case! Enough? stop? The point is made? The answers remain divided when Natures laws seem to be ignored in a judgment. There are lots of example of other situations that have been explored showing similar conditions. This one was chosen because in one form or another, in one way or another, little or a lot, it eventually touches all of us with its message and its questions about words the things that make up our languages. Our decisions our lives in our search for the better life. It is HOPELESS, KAPUT, BROKE, PERIOD.. The little fellow above will go on forever climbing those stairs until something in natures computer breaks. Maybe a very serious break for all living creatures. The common language as a stand alone tool for our search of a better life? The common form of language has been, at times, more than a little ambivalent, cumbersome, and arbitrary. Adjectives adverbs can drive the transportation of your valuable information crazy before one get it. As always they're exceptions. Poets, Comedians and those who write advertisements love it and might go out of business without it. It is HOPELESS, KAPUT, BROKE, PERIOD.. The little fellow below will go on forever until something in natures computer breaks. Maybe a very serious break for all living creatures? If he does not work he brought the internet? Is there any better road to search on for a better life? Yes, better, faster, and cheaper but it not immune to human tampering it has to have 27-7 vigilance but it can be the bestest, fastest way in the Search for that better life! Can we help our beloved languages be more accurate and precise. (there is a difference even between these.). Can one help out those dear little adjectives, adverbs and other modifiers using quantitative measurements in numbers, of time, length and mass where (ever possible)? We have the good fortune that one of the past times of dedicated language buffs is helping others with their grammar, spelling, and punctuation. They struggle with their students and each other. sometimes if not careful may miss the content of the documents entirely without them being improved. or grasped. by the helper Considering the inherent complexity of the language they are dealing with it is a wonder that they try. Searching for a better life In the commonsense world. 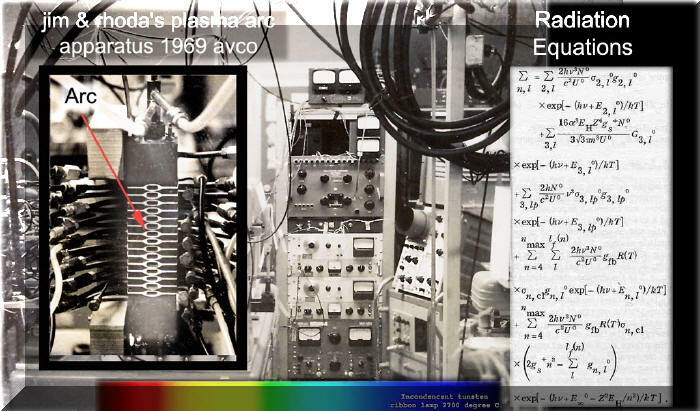 Is it possible to analyze the complex scientificscience with just bright white light or look at in shedding light of different a spectrum of colors to give us a purer view of the science world (sw) so that it is more realistic, more understandable, more useful to the larger commonsense world ( cw). What is it really like to be a physical scientist in this science world we've had for the last 400 years? 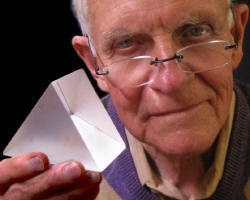 Two little pieces of glass showed us how big the universe really is compared with our tiny little earth. A little frog gave the biggest change in our lives through introducing us to the kingdom modern electricity. A tiny rock in a dark draw showed us the path to the nuclear energy available to us. The sun Has been trying to do this for billons of years. Remember these deeds happened "In spite of us". Remember those four little words at the beginning of this web site. Remember the (400 year old) Shakespearian rhythm type speech from our actor playing the part of Galileo. Evidence suggests that this sort of thing will mostly happen primarily under the surveillance and guidance of nature's laws with only tiny help from our commonsense laws. The required conduct dictated by Nature to the scientists is described in the follow the list of 10+ commandments that clarify what a successful senor scientist's daily work day, work life is really like. Some commandments are known, some guessed at , some surprising some unbelievable to the Commonsense world. The part of science we call basic research goal is searching and understand every aspect of Nature's world. It is not applied research nor engineering that focuses instead on applying the products of basic research to commercial products. During the the discovery phase of the work in science it appears to mos t people to be mostly tedious demanding work, with a 24-7 working schedule. Perseverance is essential. Intense initial and continual training (learning?) is a must. 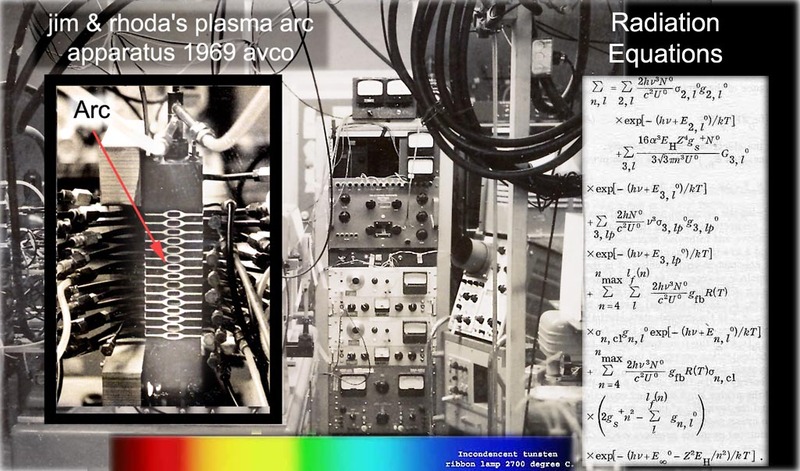 · Initiation in science involves intense training in far out things only scientists need to know and the field moves so very fast it requires constant hard work to keep abreast of advances. · Scientists must continue to learn on their own, to hold their positions and successfully stay ahead of the competition. · Brand new scientists joining the field every year with up to date knowledge will move in and overtake those that have not kept up. The average productive professional life of a leading research scientist may last 20 years, 30 for those that continue in teaching, consulting etc. Science can be a lonely world to some because communication deals with esoteric language and instrumentation. 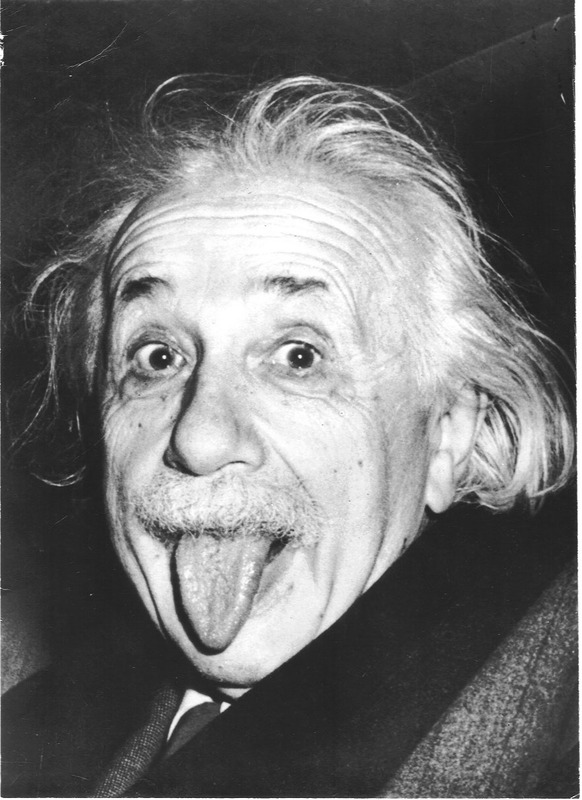 · There is a huge language barrier between that used by the general public and scientists’ precise, often esoteric symbolic language of mathematics. 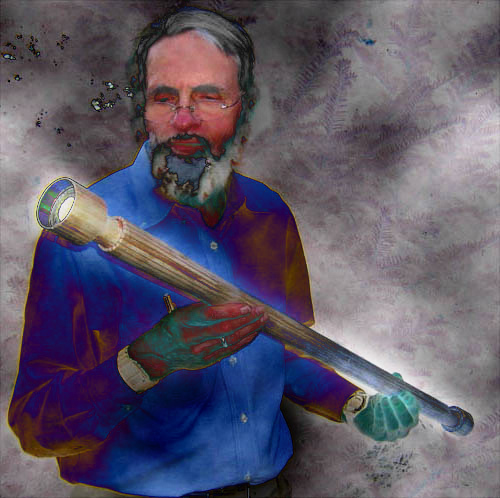 · Scientists talk about data from complex scientific instruments, instruments they have created to extend the senses. They can see, hear, smell and feel things the other people can’t with unaided senses and the words used to describe them are like a foreign language. Scientists’ work must be repeatable by others. This is the bedrock for the progress made by science and the successes it has achieved. · Scientists have to be strict, unforgiving, no nonsense policemen within their research project to assure that all of their colleagues and technicians are performing their work to the highest professional standards in all aspects that could affect the outcome of their research. 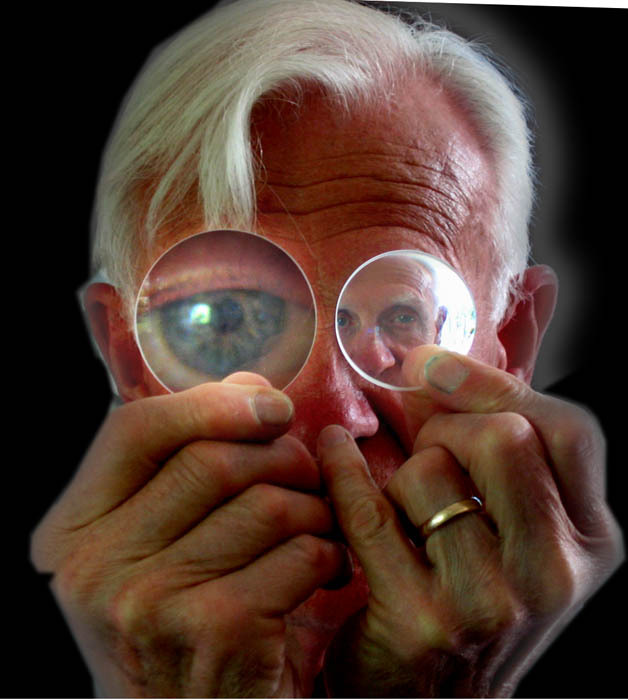 · A scientist’s work is owned by the sponsor of that work. It is published only with the sponsor or employer’s permission. · It will be reviewed by peers and experts in the field. Experimental procedures and results will be checked and tested by scientists using the work of other scientists in their work. · Scientists’ mistakes and errors are an embarrassment to the sponsor and a threat to financial survival. Career survival is based on “getting it right”. · In the long run errors and shortcomings in prior work and thought are exposed. This provides for a self correcting and confirmation process that accounts for why science has been relatively successful in its advances. · If we exert the same scrutiny and requirement for correct information and “getting it right” in all our other disciplines and institutions, much could be gained for our society. Prior work in science is the basis of new findings. In this sense scientific progress is always based on team efforts. Scientific discoveries are often at odds with simple common sense explanations based on everyday simplified observations. This makes it difficult to get public support. Few thank science, even if it’s deserved, simply because the public finds it difficult to understand what the scientists did, how they did it, why they did it, or its true value in the big picture. But then, no one knows how big that picture really is, especially the scientist. The weirdest thing about scientists though is they will fight like hell to get and keep their jobs. Because in the end they know that each piece of knowledge they find and publish adds to the ultimate knowledge base we so desperately depend on to move ahead and better the world. So the bottom line for anyone looking for a meaningful career that adds to everyone’s future is: If you’re young enough at heart, adaptable enough to be innovative and don't mind occasionally feeling like a masochist, join the scientific community! Here you will truly do something very special and valuable that few have the opportunity to do. You will have the chance to leave your mark on the world, a mark that may last for many generations and give back a little something toward what the world has passed on to you. If your interest lies in other fields that you want to contribute in, you can be a citizen sponsor for science and the basic research that gives us the knowledge to move ahead. What is the basic message, the basic thing, to pass on, to push ahead with? `"Friends! Romans! countrymen! Lend me your ears; I come to bury Caesar, not to praise him. And greviously hath Caesar answer'd it. I speak not to disprove what Brutus spoke, But here I am to speak what I do know. And men have lost their reason. Bear with me; My heart is in the coffin there with Caesar, And I must pause till it comes back to m??????? more than likely will be the cause of a troublesome journey for the reader because the senior co-author, (senior in age only,) uses "language" some believe is a form of commutations, impure many will agree but made more impurer by the 'senior co-author's, educational background of ,disa-achievements, maybe a better description of his education atonements, from a one room school caring for 8 grades, 12 students, eleven goldfish, yes 11, one sacrificed in a biology demonstration, a random number teachers with half life's of about seven months , but still determined to raise up the trouble makers in class to a higher intellectual level (maybe heaven by supplying them with enough chemistry books and sources of chemicals to cover their experiments in designing and making pepped up rocket fuels that if it worked would create a noisy journey for some of them up to kingdom-come. A distance not fully understood by the students who only thought in terms of four kings per deck but far enough to give the teachers some piece. The example of prose above hopefully speaks for itself. and nothing more should be needed to be said about humans biggest road block in moving forward to a better life. In one word "words".